Caring for a dog can be like a job in itself – so how can you make sure your dog is getting enough care and attention if you’re working full time? In the past, you might have needed to run home during your lunch break to check in, but today we can check in, feed or let our dogs out from our phones – with pet technology. A few simple but sophisticated adjustments to your lifestyle as a pet parent can help you ensure your dog is healthy and happy while you crank out your 40+ hour work week. SmartDog Collar — As a pet parent, a smart collar is the most comprehensive tool when it comes to monitoring your dog’s health and wellness from work. Smart dog collars can track location, activity, temperature, barking and give you peace of mind that your pet is safe at home. Smart Dog Feeder — A smart feeder is ideal in that you’ll never have to worry about making it home in time to feed your dog, since you can set feeding schedules or manually deliver your dogs food from your phone. They’re also helpful in ensuring your dog isn’t over or under eating and can help prevent one dog from munching on another’s food. 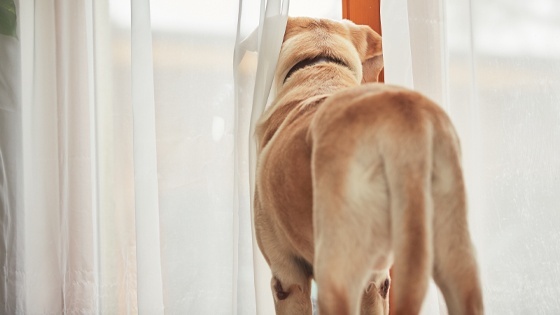 Smart Dog Door — As a pet parent, there’s a constant worry about how many hours it’s been since your dog was let out for a bathroom break. With a smart door, you can let them out from wherever – reducing stress for them and for you. When used with a smart collar, you can also set safe zones and use geofencing to ensure that your dog stays within your yard. Smart Treat Dispenser — If you’ve caught yourself wondering what your dog is doing at home while you are working, try investing in a smart treat dispenser that also offers video and audio. You’ll be able to check in from anywhere, see what’s happening at home and brighten your dog’s day with a treat. Being a working pet parent can be stressful, but new innovations in pet technology can help reduce your worries and provide a more nurturing environment for your pup. To learn more about how the Wagz™ smart solutions work together to create one completely connected pet lifestyle, click here.